A conversation with Iranian artist Mahsa Soroudi. Life in Tehran. Immigrating to the United States and Southern California. The conversation focuses on two of her art projects, “Nature’s Cadence,” and “7,500 Miles.” The first a journey with drought-tolerant succulent plants that paralleled her own “drought” as an immigrant in a foreign land. 7,500 Miles is the distance between Soroudi’s current home in Southern California, and her hometown, Tehran. In this exhibition Soroudi and fellow Iranian expatriate Parisa Ghaderi curate work from a range of Iranian women artists whose art defies Western stereotypes to explore the issues of their own lives and in their own time. A conversation with author and USC professor Aimee Bender, and Museum of Jurassic Technology director David Wilson. Recorded on 22 May 2006 in the Museum of Jurassic Technology tea room. 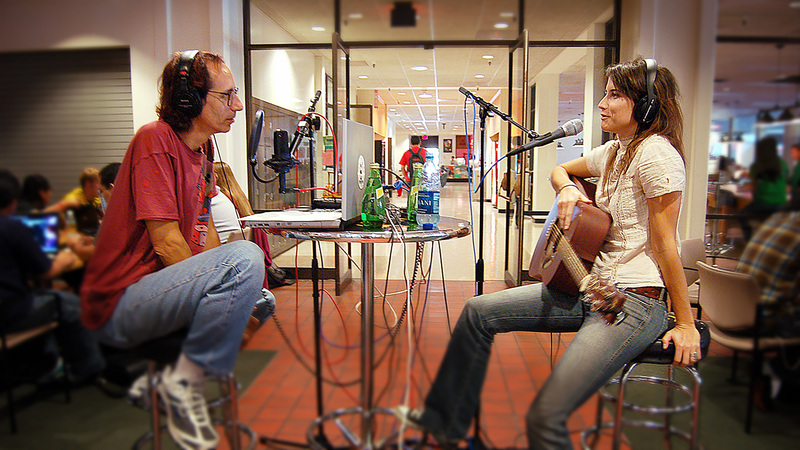 Glenn Zucman in conversation with singer-songwriter Angie Mattson at KBeach Radio at Long Beach State University.